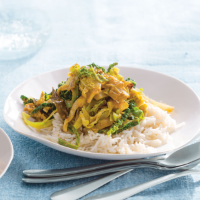 This quick and easy, meat-free curry can be ready to eat in just 20 minutes. Cook the shredded cabbages in boiling water for 3 minutes until just tender. Drain. Meanwhile, heat the oil in a frying and fry the leeks for 3-4 minutes, then add the curry paste and cook for 1 minute. Stir in the coconut cream followed by the cabbage and cook for 1-2 minutes, then season. Serve garnished with chopped coriander, if using. Perfect with steamed basmati rice.